Home » Arts & Culture » El Gran Carnaval de San Pedro is approaching! The long- standing island tradition, El Gran Carnaval De San Pedro, is set for Sunday February 26th through Tuesday February 28th. The festivities, which commemorate the beginning of the Lenten season, will be held under the theme 'Orgullo, Alegría y Pasión; Carnaval es mi Tradición.’ Combining traditional paintings and comparsas (dancing) group presentations, The San Pedro Town Council has organized several activities for the weekend. This year, the highly anticipated event will be bittersweet. The annual photo exhibit at the San Pedro House of Culture (SPHC) honoring the history of El Carnaval, will instead feature a pictorial exhibit celebrating the life of the late Felix Ayuso. Ayuso was an invaluable part of the traditional Carnaval Comparsas. As President of the San Pedro AIDS Commission, he and his group brought joy and entertainment during their participation in the annual event. The exhibit is slated for Friday, February 24th, and everyone is cordially invited to visit the SPHC on Angel Coral Street at 7:30pm to join in the tribute to Ayuso, considered 'El Rey del Carnaval'. On Saturday, February 25th, another tribute to remember Ayuso has been planned to take place at the Central Park during the annual block party. There will be live dance and musical presentations by DJ Chabo and DJ Dev. The activity starts from 6pm until. The celebration continues on Sunday, February 26th with the beginning of the three days of Carnaval fun. Activities for Sunday include, a beach party at Central Park starting from 6PM. The party will be hosted by Air Invasion Sound, DJ Hypastatic, and DJ Debbie. On Monday, February 27th JLA sound, DJ Smallz, and DJ Patron will be providing the entertainment during the foam fever teen party. The fun begins from midday until 6pm at the Central Park. On the last day of Carnaval, Tuesday February 28th, the celebration will continue at the Central Park with another foam party beginning at 6pm. Entertainment will be provided by DJ Dev, Air Invasion Sound, DJ Smallz, DJ Hypastatic, DJ Chabo, DJ Debbie, DJ Patron, and JLA Sound. During the three official days of the festivities, the traditional comparsas and painting will take place in downtown San Pedro, starting every day from 1pm until. According to local authorities, the rules remain the same. It is recommended that only children paint on Sunday. NO painting of comparsa participants, properties, signs, vehicles and people in uniform or coming from work; no oil paint or spray paint; no bottle squeezers will be allowed; no throwing of eggs or use of rotten eggs; painters are asked to respect tourists, unless they want to participate. The painting zones are: beach front from Ruby’s Hotel to the cemetery area, and Barrier Reef Drive. Non-painters are recommended to avoid the painting zones. Barrier Reef Drive will be closed to all vehicular traffic and no parking will be allowed on either Barrier Reef Drive or Pescador Drive between 1PM to 7PM on all Carnaval days. Both the San Pedro Police Department and San Pedro Traffic Department will be enforcing the rules and regulations of the Carnaval celebration along the designated areas. Comparsas will be done on Angel Coral Street, Pescador Drive and Barrier Reef Drive. 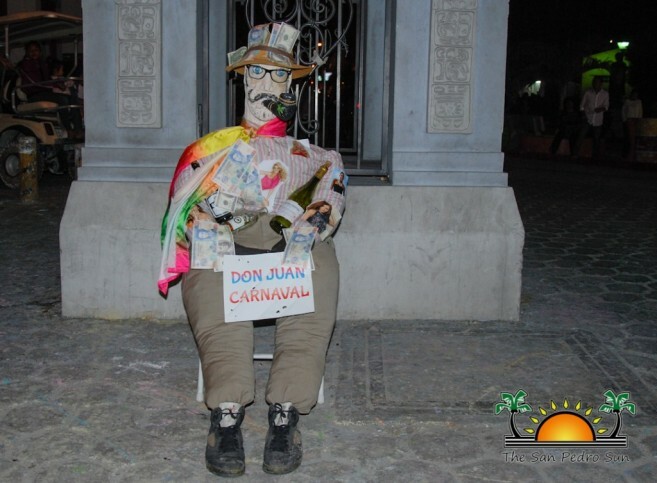 The Carnaval fever will end on Wednesday, March 1st with the traditional burning of Don Juan Carnaval at the Central Park at 6PM. Everyone is invited to enjoy and celebrate El Gran Carnaval de San Pedro!